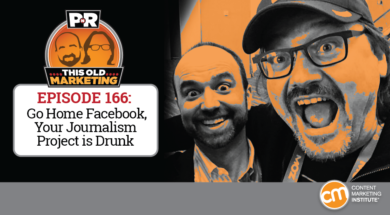 In this “hopeful” episode, Robert and I discuss the Facebook Journalism Project, including why it’s great for Facebook and not so great for the media. We also engage in a detailed discussion on native advertising, share our take on its advantages, and explore how Star Magazine was slammed by the Better Business Bureau. Our rants and raves cover Big Red soda and agencies that are buying up media companies; then we wrap up the show with an example of the week from James Vick and Vick’s Floral Guide. Pressly: The Starter’s Guide to Sales Enablement: It’s no secret that sales and marketing departments have a complex relationship. Each has entirely different objectives, workflows, and methods of measuring performance. But these departments also share the same essential need: Both require the right content, at the right time, in order to do their jobs. Pressly’s Starter’s Guide to Sales Enablement dives into how you can align sales and marketing and start building conversion-focused content today. Download it now! Native advertising, content marketing will become more effective than advertising this year (09:20): A recent MediaPost article shares four marketing predictions for 2017 from Lon Otremba, the CEO of native advertising platform Bidtellect, including an increasing realization that connecting with consumers through content is often more effective than advertising. Robert and I agree that the article plays it pretty safe as far as industry predictions go; however, I do appreciate that Otremba makes a clear distinction between content marketing and native advertising, and am also encouraged by the focus he places on the importance of landing pages. Facebook finally admits it’s a giant media company – almost (17:56): Falling into the “I told you so” files, an article on Fast Company outlines recent moves by Facebook that push it farther into the realm of professional journalism – including the just-announced Facebook Journalism Project, which was described by the company’s director of product as an initiative to establish stronger ties with the news industry. I have a bad feeling about this, as it seems like the media partners and content owners who participate in the project will be giving up more than they could hope to get from their involvement. Robert concurs, and shares his view of ways the effort could make Facebook’s fake news problem even worse. Star Magazine discontinues SlimFast ads after BBB challenge (26:16): An article in Folio recently reported that American Media, Inc. agreed to discontinue SlimFast ads that ran in the weekly celebrity publication amid claims that they don’t live up to industry transparency standards. However, AMI has issued a response disputing the claims made by the Better Business Bureau’s National Advertising Division (NAD) and asserting that the ads were not pulled – the complaint’s timing simply coincided with the scheduled conclusion of the campaign. As ironic as we feel it is to make an example of Star Magazine for factual inaccuracies in ad content, the bigger concern this raises is the industry’s overall lack of labeling to delineate between sponsored and editorial content. 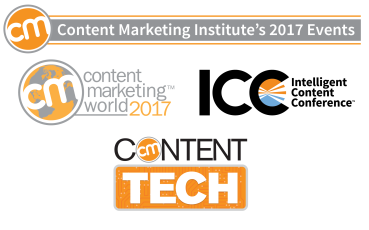 Content Marketing Institute’s 2017 events. Whether you are just getting started with content marketing or are looking to take your expertise to the next level, CMI’s portfolio of events has you covered. From our free virtual ContentTECH conference to Content Marketing World – the largest annual gathering of content marketing professionals in the industry – we offer a wide range of unparalleled training, education, and networking experiences. Check out all the events we have in store for 2017, including our strategy-focused Intelligent Content Conference – use the code PNR100 for a special discount on registration. Robert’s “rant-y commentary” No. 1: Following on the recent purchase of women’s lifestyle publication PureWow by Gary Vaynerchuk’s VaynerMedia, AdAge ran an article debating whether recent media property purchases made by ad agencies are likely the start of a full-blown trend. Robert debunks one of the counterpoints cited: that large publishers are unaffordable. Robert’s commentary No. 2: A story Robert found to be very interesting – and one that he feels isn’t getting enough play right now – appeared in Marketing Week, covering the stricter regulations online advertisers in the EU will soon be facing when it comes to targeting consumers with advertising. Robert explains his thoughts on why the article is a bit of a whitewash of the topic, as well as why these new laws may actually be good for content marketing, despite presenting major problems for the ad industry. Joe’s rant: I recently learned about an intriguing content-based initiative undertaken by soda brand Big Red, which partnered with Weber Grills this past summer to create a barbecue-themed spate of content called 100 Days of BBQ. The effort included a range of informative and educational content – including grilling tips and recipes – as well as a sweepstakes, and reportedly resulted in a 16% increase in sales of Big Red. But when I tried to explore the program a bit further, I discovered that all the content had been taken down, and in its place was a simple splash page stating that the promotion is no longer open. I find it tremendously disappointing that this brand failed to capitalize on the initial success of its content, when it could have extended the story – and continued to engage the audience it built – with just a little extra effort. This week, Robert discovered a publication that rivals John Deer’s The Furrow as one of the earliest examples of content marketing: Vick’s Illustrated Floral Guide. While the publication itself is impressive for its time, Robert feels the person behind the effort is what’s truly worth noting. James Vick can be considered one of the first true content entrepreneurs (a la Content Inc.), as he approached his pursuit of business success by building an audience first, then deciding what to sell them. Beginning his career in the printing industry as a writer and editor, Vick later transitioned to the business side, becoming a publisher in 1855. Around this time, he realized he could channel his personal passion for growing flowers into a viable business opportunity. Vick then purchased his first gardening-related title, The Horticulturist, moved it to Rochester, New York, and leveraged it to publish books, resource guides, and other content products that would help people cultivate their own gardens more successfully. One such initiative he created was The Floral Guide & Catalogue, a publication that ran for 60 years, amassed 250,000 subscribers, and eventually became a revenue driver through paid subscriptions. It was this publication that enabled him to build and market a thriving gardening seeds-and-supplies business, which was eventually acquired by Burpee – a name that continues to be synonymous with horticulture to this day. It’s an impressive example of how content can be used to help a unique business idea take root and grow.